Welcome to the Official NC A&T MAPS page. Here you will be able to connect with us and follow our campus involvement. The Minority Association of Pre-Health Students (MAPS) represents the undergraduate and post-baccalaureate students of the Student National Medical Association. 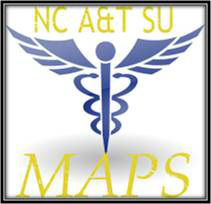 The NC A&T State University MAPS chapter was initiated in 2006 and welcomes undergraduate, post-baccalaureate, and graduate students from all majors interested in various areas of healthcare including but not limited to medicinal, pharmaceutical, athletic, dental, veterinary, and chiropractic medicine. N.C. A&T's MAPS chapter maintains approximately 50 active members yearly. This association provides invaluable professional development and networking opportunities including Recruitment & Informational Sessions by summer programs and professional schools, sponsored Meet & Greet Mixers with local healthcare providers, a sponsored formal Shadowing Program in collaboration with the Greensboro Medical Society, hosting Personal Statement Development Sessions, participating in Volunteer Activities around Greensboro, and organizing professional school visits. To join or learn more about the organization please contact the chapter's President Robin Jones.